I would rate even higher if I could. They are efficient and friendly. Very Convenient. Glad facility is here. Keep doing the good work. It has been a great experience renting a storage unit from you. Thank you. The Staff is the Best! Prices are a bit on the high side. Hard to maneuver a large rental truck on site but is doable. Staff is friendly. Mike Pope 2/25/2019 Was the equipment clean and well maintained? Yes Would you recommend this location to a friend? Yes Comments/What can we do to improve for the next customer? My experience was perfect, with absolutely no problems. There was nothing that could've made better, because it was already perfect. I highly recommend this location to rent U Haul vehicles. I want to thank connie for helping me and my son get storage. It's hard to find kind associates like that. This place is clean and I say store here to all my friends. Connie was very helpful and organized in the rental process. We will be storing for a year or more. Wish I had more stuff 2 store just so I could chat with Linda up front. Very warm, friendly and attentive person. Great facility, friendly staff & helpful too. Easy access and have never had any problems. "very helpful if you have questions and access is very easy." The staff is always there to help in any way. I enjoy the very friendly staff! I have always been treated well at this facility. Great Service - Nice People - Clean Premises. Monthly emails are great. Would definitely rent @ T'bird again. Friendly, clean. Would definitely use again. Robert S. on 12/7/2018 Rating: FIVE STARS Everything was perfect, had a great experience. This the second time I've used this facility and have never had any problems, Connie is the best. I came by to look at this place. Connie was helpful and knows her stuff. I may have asked too many questions and she answered all of them. lol. The place looks like a safe place to store my stuff. I plan to move in later is month. Manager asked me to review my experience, I would give this place a 8 out of 10 because first impression is everything to me. "I like the staff"- H.S. Staff is friendly. Connie is professional and this place is always clean. If i could give 10 Stars i would from the staff be so kind to the property being so well kept up this place is just perfect. I came in today asking questions about renting a unit. Linda was so cheerful, very knowledgeable. Great employee. Whenever we step into the office, Linda greets us with a smile. She has been helpful on many occasions. She is a delight and always professional & prompt. Thunderbird is awesome. Always love coming here!! "Very friendly and helpful"- Linda G.
Linda Grana 10/20/2018 Would you recommend this location to a friend? Yes Comments/What can we do to improve for the next customer? Connie was fantastic. Very friendly and helpful. "Thank you for the great service"- Arron J.
Aaron James on 10/11/2018 Would you recommend this location to a friend? Yes Comments/What can we do to improve for the next customer? Connie and Linda were fantastic! They need no improvements. Thank you for the great service. Because my personal belongings are stored here, it feels a lot like "home" to me. Linda (in the office) has always been kind, friendly and helpful and I feel like we've forged a friendship. Thunderbird storage has been amazing. Would definitely rent again. The staff was great. Made you feel very welcome. Was the equipment clean and well maintained? Yes Would you recommend this location to a friend? Yes Comments/What can we do to improve for the next customer? We had a great experience with Connie from Thunderbird Mini Storage and our Uhaul rental there. She went above and beyond for us to make sure we would be able to have the truck available to us at the crazy hours we needed it. We were very impressed by the level of customer service and the terrific price for local rental! Very Polite and helpful staff. Clean Facility. I would like to say a few words about Thunderbird Mini Storage. I have been there since 2012.I have Classic cars and it is the best I have ever had. I found it by accident it is so hidden. The people, price, and location are perfect for me. I will stay there as long as I have cars. Units are all very clean. Mgmt. east to deal with. We were so happy with our storage-the people here are so nice and friendly-I would definitely rent storage here again! Great folks to work with! Helpful. I picked and went with Thunderbird Mini Storage because the location and distance were convenient for me, plus it is a safe area. I rated price a 4 and the rest a 5 because there are other locations a bit cheaper. Downside is less security and safety. The staff are awesome, amazing and super friendly. I felt like a family member to them. They're service animal friendly & LOVE animals. I'll miss them and hold them dearly. No one better to rent from. Everything was great and I would rent again. This was the easiest and most useful storage facility I've ever used. Thunderbird Mini Storage is the best place to store your items. Everyone is so nice & helpful. I would rent from them in a heartbeat if I need to rent again. Wonderful people. Easy access to storage. Rated 10+. Great place to store your items. Always a pleasure to stop and visit. Wonderful place to store. Staff very helpful was a plus. Great Service, easy to use. I've been very happy. Very helpful in getting set up and quite friendly. Great secure spot, close to our home. Great serviced and access availability. Very friendly staff. Excellent facility. The use of the storage facility was pleasant and convenient. We will recommend to anyone that needs a place in this area. Thunderbird Mini Storage is the best storage unit I have ever used. The staff is always very friendly and very, very helpful! Thank you. Nice folks & very helpful and caring along with neat and clean strorage! Just the Best. Management is great to me!!!!! Staff has been very helpful, if staying in Phoenix- would keep my renal space over any other. Excellent Service, Always has been. Great storage facility, clean, easy access and nice friendly people to do business with. We rate it an A+ facility. Bill paying is made very easy and I can choose how many months I want to pay. They are very good about sending notice when the bill is due. Any discussions with the management is very professional. I have been with Tbird mini storage since 1995. The property is always clean. The personnel are professional and very friendly. They have always taken care of my needs and you can't beat the prices. I would always recommend Tbird mini storage to anyone. They have the best prices, easy access, clean. Would pass it on. Everything was better than I expected.. The woman in the office was amazing so helpful and easy to get along with. She was not pushy and didn't try to oversell me a unit. I highly recommend this storage facility. Very satisfied with this location. Good management, clean property, very good rates and daily access. After checking nearby places, we settled on Thunderbird because of these factors. It's the best in Sun City. incredible value for a 5x5. nice friendly staff. Would definitely recommend to friends. Linda was very nice and informative. I phoned to reserve a unit for my dad, so when he got there he put it under his name. When we found out about the move in to our winter vacation home we needed the unit earlier so I phoned and they were very obliging. As it worked out we got it earlier and got a bigger unit. All went very smooth like clock work. Finished all the paperwork in 10 minutes, able to set up automatic bill pay, insurance was included in the rent price. Nice facility, good security and it's well-maintained. The manager, John, is friendly, personable and helpful guy. I've already referred two friends who are looking for a better storage solution. Was moving out of old apt and stumbled upon this location for storage needs. Staff very friendly and helpful. Easy access to location. Love the place, never a problem. Price is good I'm telling Everyone I no. I like this place its great location clean like securities great in and out, people in front office explains everything, take time for you. I had rented from these people once before...so I knew that they were very welcoming and pleasant to deal with. This second rental was no different....paperwork was competed in good time, and I was introduced to my storage unit. It was super-clean and ready for use. I would recommend these people very easily! Moved from out of state and needed a place to put my belongings once my 'cube' was dropped off. Very helpful team in choosing the right unit for what I needed stored. Made suggestions knowing that my stuff was in a reloCube, and I needed to move it from the cube into the storage unit and it was 115 degrees outside. They worked cooperatively with me in getting everything coordinated. Thank you Thunderbird Storage! Internet-helpful, people-friendly and compatible pricing. Very nice facility...good price, close to home, great customer service! Would highly recommend this facility! Clean, private and secure. The property is clean and very well maintained. I never have a problem getting in or out of my unit, even with the interior unit I always have access. I would recommend this property to everyone I know. Feel safe with my items in the storage. Clean area. Easy in and out of the area. I have rented here for going on 15 years now & it has always been the best storage facility around. Great location & reasonable prices. We have enjoyed many years of service from Thunderbird, following their years of service to our family members before us. We have up-sized and down-sized several times as our needs have changed over the years with ease. Great and helpful staff. Very satisfied with their help when I have a question, cleanliness and pricing. John and Linda are very nice. They are very helpful. Thank you. The employees at Thunderbird Storage are extremely friendly and helpful. The premises are clean and it is very convenient to where we live. Worked with us to find the space and price our little group needed. We have not had any problems, staff very polite and helpful, meets our needs. Keep us the good works for people in this area and the price is fair. We have been using Thunderbird Mini Storage for over 6 months and find them to be very helpful if you have questions and access is very easy. We have no complaints and would use them again. Also, we certainly would recommend to friends. I'm very pleased. My only issues is with the on-line payment link. Every time I attempt to pay my bill online, I receive an error message. Otherwise, this facility is clean and very well run. This is the best storage unit I found. I didn't need to look anywhere else. Best Promos! T-bird Mini Storage is a great place to do business with 0 Very friendly and professional. The storage unit was clean and very accessible. Excellent Service ! Nice folks & professional. Long term renter, great staff, great location, would highly recommend. I really enjoyed Linda & John, they were very helpful each time I came in. They always had a smile. I mean both not one, both. Thank you! You were fantastic, clean and easy. I have been a tenant since 2001 and have had as many as 5 10x20 units at one time. I started out with a 10x10 and now I just need one 10x20 which I have. Secure location and courteous staff. You are always accommodating and courteous. Linda & John have always helped us, and made us feel safe at the complex and like we had a friend there. Thank you. Best Part of the Camsm team. Thunderbird Mini storage has been run by Linda and John for Several years They always in my experience have greeted not only their tenants but co workers in the Cox Armored team with the utmost professionalism. They are the folks to meet. you cant go wrong here. Great Storage place! Awesome people in the office ;) !! Great service, friendly & helpful. Great location - priced right, secure setting! Always nice to talk to and help. Great location. Staff is Awesome. Wonderful to work with - Always have a smile on their faces- Great assets to your organization. Regards. PS Thank you!! Very friendly people, great location, priced right. Great, Perfect for what I needed. Super Friendly Staff! Love you guys! (Mgrs.) John and Linda are the best. Great Place, great customer service. Many thanks for your accommodations. Very clean facility. Staff is outstanding. John was very efficient. Linda was always kind. The people here at Thunderbird Mini Storage are like family and they treat us like their family. This is a very nice place to store your possessions. Great Place!!! Secure, clean & great staff!!! Great clean unit at n affordable price. This is one of the best facilities around. Clean, friendly staff always available to assist, safe location. Recommend to anyone looking for a storage area of any size. Very nice storage facility. These folks go out of their way to help with whatever you need. Almost like family. Don't go anywhere else! Very Freindly & nice, no fuss, no uss and would recommend to my family & friends. Your staff has always taken the time to assist me in anyway possible. Thank you very much. Staff is very courteous! I would rate higher than 5 if I could. Friendly helpful staff! Would recommend to others. Friendly- Showed best interest to me. Helpful & easy to do business with. Your staff was always friendly and helpful! I would recommend your storage facility to anyone needing one. Thank You! Just the right size at a great deal. Linda was very helpful and nice. I've been with Thunderbird for 17 years and they have been most efficient. Thank you for the excellant service and we would readily recommend your facility to those in need of a storage unit. Staff is very friendly, lockers very clean. This was a most friendly storage center. Everythng was very streamlined to check-in and the staff was frofessional and fun to d eal with. This is a great & clean place. This is such a convenient area and the staff are so accommodating. Linda was very nice and very informative. Thank you very much. It is a pleasure safeguarding our stuff at your place. Finished all the paperwork iin 10 minutes, able to set up automatic bill pay, insurance was included in the rent. Very good place to store. Nice facility, good security and it's well-maintained. The manager, John, is a friendly, personable and helpful guy. I've already referred two friends who are looking for a better storage solution. I like this place, its great location, clean. Like security, great in and out. People in the front office explain everything and take time for you. I had rented from these people once before...so I knew that they were very welcoming and pleasant to deal with. This second rental was no different....paperwork was completed in good time, and I was introduced to my storage unit. It was super-clean and ready for use. I would recommend these people very easily! Very helpful team in choosing the right unit for what I needed stored. Made suggestions knowing that my stuff was in a reloCube, and I needed to move it from the cube into the storage unit and it was 115 degrees the day of my move. They worked cooperatively with me in getting everything coordinated. Thank you Thunderbird Storage! Would highly recommend this facility. I would definitely recommend this storage facility to anyone. Super friendly, efficient and affordable. I felt very good about using your facility. Linda was so pleasant and all rental procedures were presented so well! Very friendly and nice facility. Will definitely recommend to friends and family. John and Linda Have been very accommodating to our needs. Wonderful service! I have been using Thunderbird Mini Storage for several years and I have always found the facility to be very clean and well kept. The office staff (Linda) is always a pleasure to deal with. Happy with/the unit. Great service! Nice people. A1 - I couldn't give them a higher recommendation. Never had a storage company take such a personal approach to ensuring my satisfaction. They were great at reminders and fast processing every transaction. I couldn't give them a higher recommendation. Thanks for your kind service to my Mom and me over the years. As a previous renter at Thunderbird Mini Storage, when we needed storage again, there was no need to look at any other place. Our go to storage facility for our clients in the area. Great place to rent. Would highly recommend Thunderbird Mini Storage. My second time to rent. Very dependable staff, well organized business in a convenient location with reasonable prices. Would definitely rent here again. Lucky find, very clean, nice location. Staff very friendly. My family has rented from Thunderbird Min Storage for over 10 years and they are GREAT!!! Their units are always clean and have amazing staff, very friendly and accommodating! Thank you T-bird Mini Storage!!! Was referred to Tbird Storage by a family member. The staff is very friendly and helpful. I met the manager of Thunderbird at the bank where I work, he was always very nice and friendly. 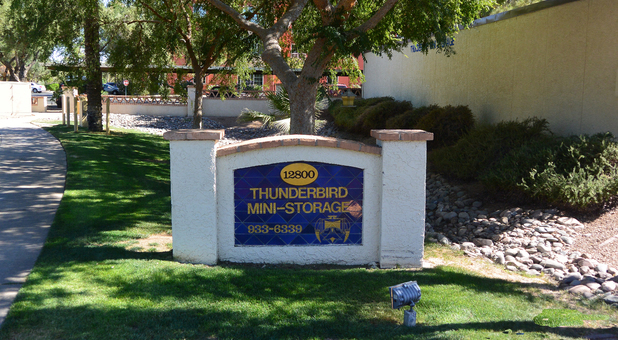 When I needed storage I knew I wanted to rent at Thunderbird Mini Storage. Moved from Illinois. Made reservations with the manager. Everything went smoothly. Great experience. I would rent here again if ever needed. I will tell my friends about Thunderbird Storage. I reserved a space thru Sparefoot. Everything went smoothly. This place is so great, very clean and a friendly staff!! I've go two large units here. What a great deal!!!!! Found this location on the internet. Definitely a five star place. Friendly staff, well maintained, clean & conveniently located. Off the beaten path in a quiet setting. I would like to thank you and your staff for the excellent service and understanding with our mishap about the billing date. Incredible value for a 5x5 nice friendly staff. Would definitely recommend to friends. Only found out about Thunderbird Mini Storage by driving by. In a quiet location and serene setting. Excellent priced storage and customer service. Was referred by Vista Del Rio. Good recommendation. Everything the website indicated and more. A1. Five Star overall rating. Clean, easy access, great location, excellent service. Rented here before. Convenient, clean, well maintained location with friendly staff. Overall the best in all categories! Found this excellent site on my TomTom Global Positioning Unit. Off the beaten path, but easy access, quiet lovely location. A lucky driveby find. Great Service & storage facility. Superb in all services. Found Thunderbird Mini Storage on the user friendly internet. Thunderbird offers a "Refer A Friend Program." The referee gets $25.00 for referring someone who rents from Thunderbird. I hope to participate. Off the beaten path location. Found T'bird Mini Storage by driving past it, then locating it on their website. Overall five star rating. Overall top rated storage facility. Booked my unit through Sparefoot. Received a call from the main office right away. They were very nice to me on the phone. I used this storage company years ago and liked this place. Just rented another space. I made reservations through an online reservation link. Though I was pleased overall they did not have the unit size that I was notified was available right up to the movement day. Since I had two other loaded vehicles awaiting paperwork completion I decided to accept a larger size. It really wasn't too big a deal and the cost for the larger size was not that bad. Friendly staff, well kept and maintained location. Great location. Located this facility on the Web. A Top 5 rated facility all the way. Pleasant staff, well maintained storage facility. A friend took advantage of the "Refer A Friend Program" and referred me to Thunderbird Mini Storage. My friend will receive a referral feel for the recommendation. I found this excellent storage location by driving by. Overall, my experience has been pleasant. Friendly Staff. Storage unit was very clean at time of rental. Location is convenient and the price excellent. Facility is very well maintained. Linda was very friendly & helpful. You have been very accommodating during my rental. Thank you. Been a long term tenant with Thunderbird Mini Storage. Excellent service, friendly staff and very helpful. Great Staff and Great place to do business with. Top rated in every way, friendly staff, cleanliness, and convenient location. Awesome service. Found site on the web. Overall service, friendliness, cleanliness are excellent. Very safe area. John is great to work with as well as Linda! Prices are better than U-Haul's and others. Great safe location. Best place I've ever stored my things. Thanks, Thunderbird Mini. Thank you John & Linda for all your help. It was a pleasure to do business with you. If we ever need storage again, we'll come and see you. Very clean facility. Extremely helpful personnel. Highly recommend this storage company. Office Staff Very Competent and Friendly. Very clean and dry - easy access to all units. Love this place, professional staff.